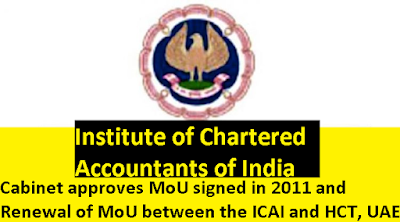 New Delhi, 3 May: The Union Cabinet chaired by the Prime Minister Shri Narendra Modi has given its ex-post facto approval for the Memorandum of Understanding (MoU) signed in 2011 and Renewal of MoU between the Institute of Chartered Accountants, of India (ICAI) and Higher Colleges of Technology (HCT), United Arab Emirates. HCT and ICAI will collaborate to offer short professional courses in the domain of accounting, finance and audit in UAE via HCT's Centre of Excellence for applied Research and Training (CERT). The proposal seeks to advance the goals on equity, public accountability and innovation. 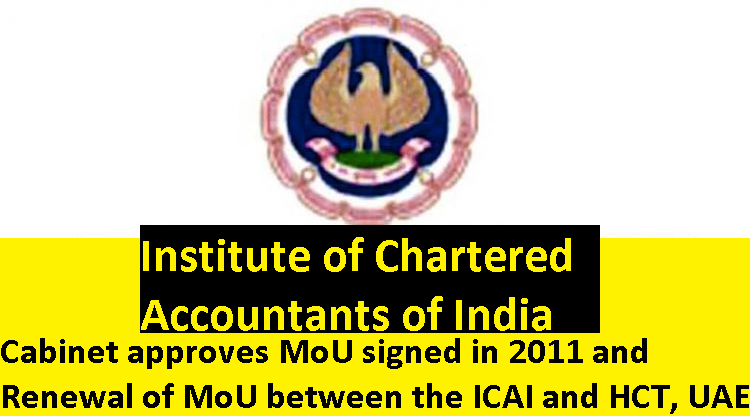 The ICAI is a statutory body established by an Act of Parliament of India namely The Chartered Accountants Act, 1949 to regulate the profession of Chartered Accountancy in India. HCT UAE is a community of more than 23,000 students and 2,000 staff based on 17 modern, technology-enhanced campuses in Abu Dhabi, Al Ain, Dubai, Fujairah, Madinat Zayed, Ras Al Khaimah, Ruwais and Sharjah, making it the largest higher education institution in the United Arab Emirates (UAE). HCT is dedicated to the delivery of technical and professional programs of the highest quality to the students within context of sincere respect for all beliefs and values and has the vision to be an internationally recognized and accredited provider of technical and professional tertiary education. The mission of HCT is to be a key education fundamental pillar on which a modern nation is built. The ICAI has considered renewal of the MoU between ICAI and HCT, UAE to work together in strengthening the Accounting, Financial and Audit knowledge base within UAE through this MoU. The MoU with HCT was signed on 4th January, 2011 for a period of 5 years.